Cambridge bowman Wayne Pommen has been forced out of Sunday's Boat Race after breaking his left wrist in a training collision on the River Thames on Friday. He will be replaced by 19-year-old Ben Smith whose older brother Matt is in the Oxford crew. It will be the first time in the history of the event that two pairs of brothers will race in opposing crews. The Livingston brothers, Cambridge's James and Oxford's David, were already in their crews. Canadian Pommen was injured when the Cambridge crew, practising rolling starts near Putney Bridge, was in collision with a harbour master's launch. An investigation into the incident is underway and is being conducted by the Kent Division of the Port of London Authority. Pommen was taken to the Charing Cross hospital for treatment and X-rays. "His wrist has been put in a rigid support and he has accepted that he will not be able to row," said Cambridge coach Robin Williams on Saturday. "It is obviously very hard for him and we all feel for him. "We have decided to move Ben Smith into the crew and he will now have a lot of work to do to adjust and settle in." German Matthias Kleinz suffered a blow to the head in the incident, but the 27-year-old will take his place in the race. Three oars were broken in the collision. "This was a regrettable incident and an enquiry is underway," said Race Director, Dominic Reid. "We feel for Wayne and our thoughts are with him." 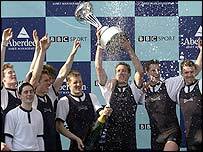 The Boat Race is one of the most popular events in the British calendar and attracts a crowd of around 250,000 to the banks of the River Thames. For the last five years BBC's television audience for the event has averaged over six million.